So what is a “Catch All” mailbox? Putting it simply a Catch All Mailbox is a mailbox where all emails go when you do not want to lose emails that senders send to your organization with typos or addresses that do not exist in your Exchange organization. For example, my name is “Allen” and my address is Allen.White@techieshelp.com, however I get people spelling my name “Alan”, “Allan” and “Alen”, so the best way to catch this emails is to set-up a rule in Exchange 2013 that catches these misspelled emails so we don’t lose them. That is the plus side of this solution, the downside is that you will get a lot of spam in this mailbox as any address that does not exist will also get sent there. Swings and roundabouts. 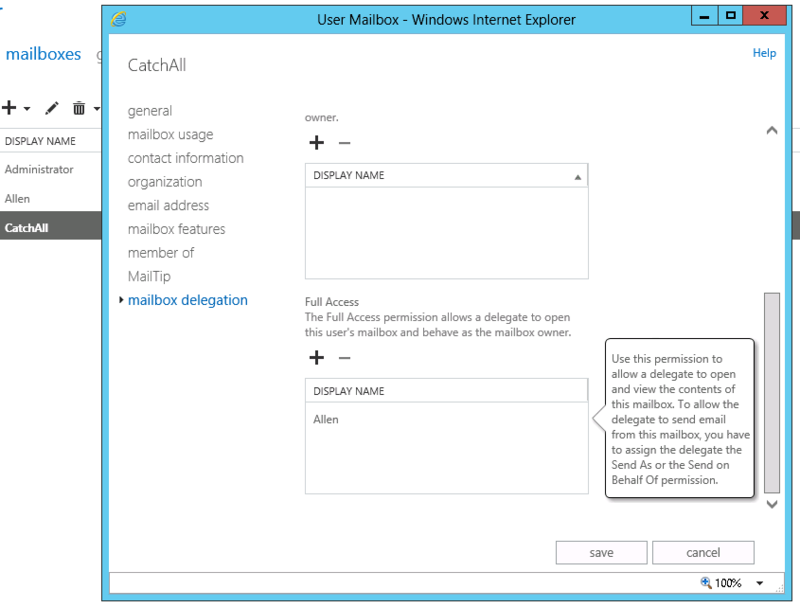 There is a script at the end of this article provided via a third-party company that will create a catch all mailbox, however the following is how to do it with the 2013 ECP. The first thing you need to decide on is what the mailbox will be called, once you have create a new user in Exchange 2013 with that account.Ive called mine simply “Catch All” as seen below. We will next create a rule that collects all these emails and sends them to the catch all account. First in the ECP / EAC select mail flow. We now select rules on the menu and click + to create a new rule. As you can see below the firs step is the give the rule a valid name, then you need to set “Apply this rule if” the sender is located then in the pop up Outside the organization. Then you need to select “Do the following” and select Redirect this message, again a popup will appear where you can select the user you would like the emails to go to, select the user account you created in step one. Now this is the important part of the rule, wen need to make an exception and the exception is that the recipient is located in the organization. 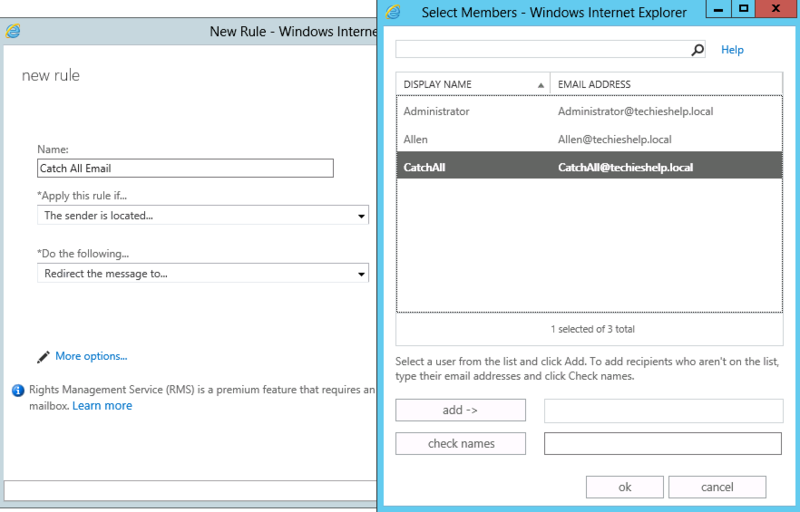 To see this option click More Options, then select “Except if“, then set it to The recipient is located and in the pop up..Inside the organization as seen below. This basically means that all emails will be sent to the Catch All mailbox UNLESS the users exists inside your domain. 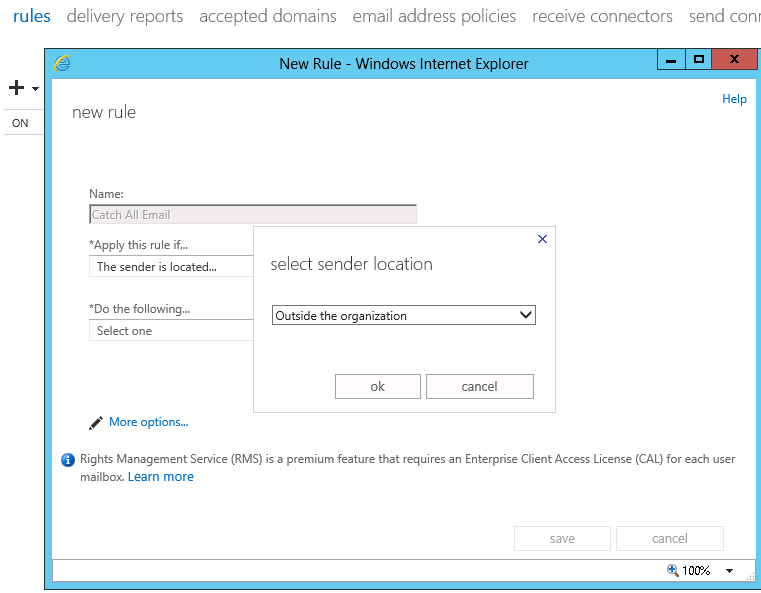 That is the rule finished, simply click save then restart the Microsoft Exchange Transport Service to make sure the rule applies. The next step would be to allow someone access this this mailbox, they can either manually log in as the user and check the account or go to Recipients then the properties of the account you created. Select Mailbox Delegation, scroll down and choose full access. Add the user who will check the catch all mailbox. 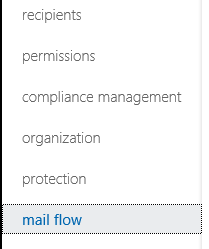 They can now open the mailbox in Outlook as an additional mailbox. Below ive given the Allen account full access to the catch all account. If you run Exchange 2010 or 2007 you can use this script below to install a catch all agent script. Ive not tested this on Exchange 2013, so if someone does test it and it works then by all means let me know! – Update see comments below, this works great! Can someone test Exchange 2016?! Great site and great article Allen, I live in the North East myself. Do you know of an easy way to do this in Exchange 2010 at all?? Cheers. Investigation shows me a Billingham lad working in teeside and you eat curry and chips at your desk and you have a HP pc, youd mostly likely call me a dirty mackem ***** ;). On Exchange 2010 its exactley the same as the rules are identical. The only difference is the naming, you need to go to the section named “transport rules” This is in. Organization Level > Hub Transport> Transport Rules. Then just use the same rules as ive created. If you need a hand then drop me a line :). Haha yes you would be correct 🙂 and you’d most likely call me a smoggy 😉 I sorted it last night, its up and running. Thanks for replying though. If you’d like me to add any articles for you at any point just let me know, id be happy to help a great site like your own. Great article, although it did not work for me. Despite choosing redirect, my senders still get NDR’s and the catch-all never gets the message. Wondering how something seemingly so simple could not be working. Followed the above to the letter, and even restarted the mail transport service for giggles. Were you using final version of 2013? Morning Tony, yes full blown 2013, (I work for an MS partner so had it a while), I dont suppose you had Recipient Filtering enabled? this would reject the message immediatley and generate NDR`s as obviously the typos addresses do not exist in the domain? 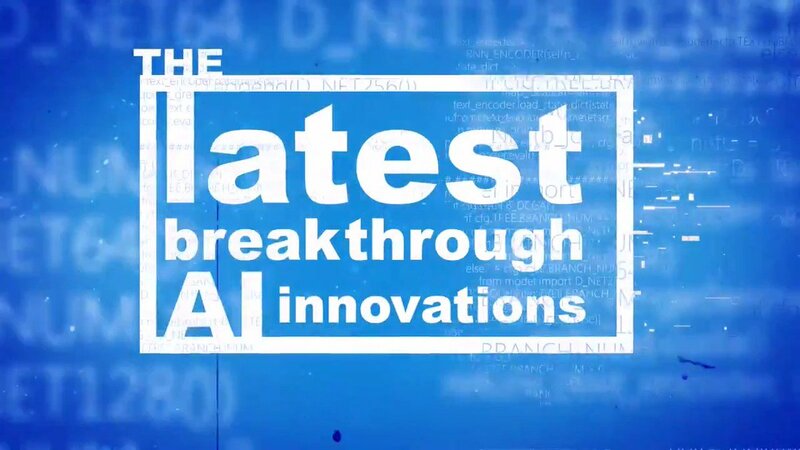 Check th MS link. After much trial and error, it dawned on me that to make this work you need to set the Exchange server as non-authoritive for your domain. This catch all solution then works perfectly. I was unable to get this working properly, I ended up following Trevor’s suggestion to change accepted domains from Authoritive to Internal Relay and I was still unable to get my catch-all setup to work. Apparently, the “recipient is inside the organization” predicate doesn’t verify if a particular user’s email address is valid. It only looks at the domain name to determine if the email address is in an accepted domain, and is therefore considered internal. So using this predicate, all real and fake email addresses in the domain are considered internal, as long as the domain is an accepted domain in your Exchange organization. 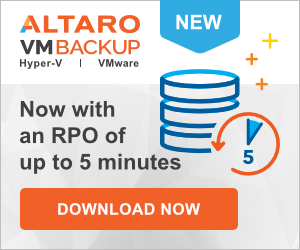 After that, regular recipient lookups occur, and the fake email addresses fail with an NDR. + Create a dynamic distribution group that uses the filter “all recipient types” (or whatever recipient types you want, like mailboxes only). That should define the valid email addresses in your org. + Change the exception in the transport rule to “Except if the recipient is a member of…” and specify the dynamic distribution group. Thanks ! After more than 3 hours trying to make it work, reading bad news from MS support pretending it is not possible, your method saved my night. Thank you very much for sharing, it works for me. An intelligent mackem? Who’d have thunk it? Yes we do exist 😉 But how did you guess a Mackem? WHOIS? If you run Exchange 2010 or 2007 you can use this script below to install a catch all agent script. Ive not tested this on Exchange 2013, so if someone does test it and it works then by all means let me know! My case is completely different. 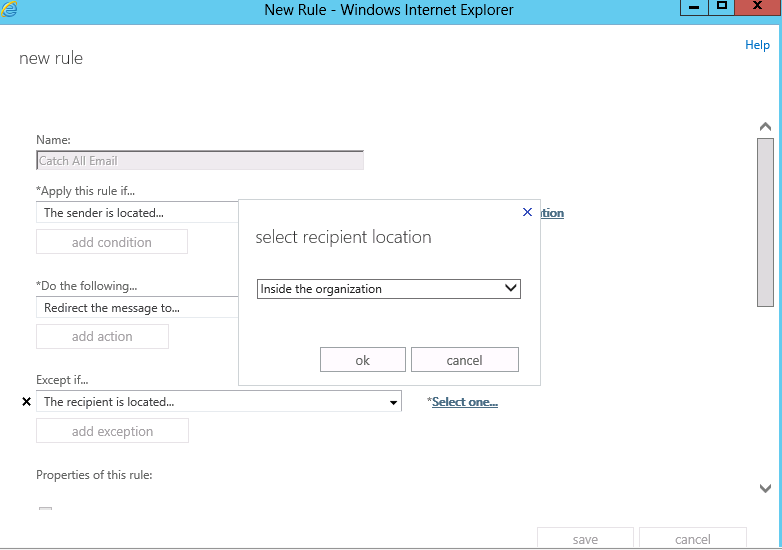 I am using Exchange 2013 sp1 and over there it is not showing me “The recipient is located ” at all. It only shows “The recipient is”. Can you suggest. ? I have used the Catch all agent from Codeplex, with great success. The only issue is, that the catch all transport agent HAS TO be installed, while your still at level CU3 or lower. We are now at exchange 2013 CU7, and the Catch all agent still works like a charm. I got the Catch all agent from CodePlex to work on Exchange 2013 CU7 in my DEV environment. I’m not sure why Peter stated that it needed to be installed on CU3 or earlier for it to work. Thanks for the update Lawren, great to know these plugins work with later versions. I am trying to set this up for our company, who is preparing to move to Office 365, but have not found the correct combination to allow this to work in O365. For 2016 i discovered that you also have to set the accepted domain as internal relay domain and in stead of exception > receipent inside org. I added the domain.local you don’t want to check for catch all and then it started to work. Windows cannot find the local profile and is logging you on with a temporary profile you may see the error Event ID 1511 in event ID. Solution here.